Facebook inbox is a person, not an automated money machine. 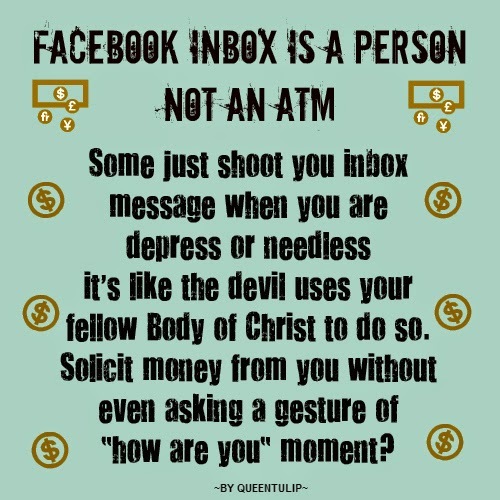 Posting this topic since I received inbox messages most of the time from Facebook users who does not know how to connect with you and suddenly ask for money. I am not referring to those scams or fraud but for those who got you on their Facebook friends list for some improper motives or attitudes. These are Facebook users who also not connecting with me on a personal level and Gospel ministers. How would these people suppose to know I am in current need for my surgery after my recent husband's surgery, if they never ask a personal question? Or It can be anything....? It does surprise you, how selfish some fellow Body of Christ represent their ministries with their fellow brethren. It lost the savour of re-connection to collaborate with them. This is not actually showing the real love of Yeshua within a person's heart if this day in age does not use Social Media in the proper manner or at least a good gesture to say so and so. God knows, and he is the Controller when I cannot give what I do not possess in His time and space. I can only give when I have it not when I am living with mortgage debt and a family first in need as well! I am only one person and not a Saviour to everyone! I am not a greedy person either. I grew up as a pastor's kid and my parents already taught me to give away my clothes or stuff since I was very young that has been given to me abundantly. I am educated at home by my parents to give what you do have even if you do not have much. Sometimes, pastor's life and family can easily self-sabotage themselves as I have seen it many times growing up as one. There is a season for giving and a season for receiving. Giving opens door for those whose your heart prompting you for. There is giving, which is earned by due respect. There is giving what the Bible says to feed the hungry without expecting nothing back in return. Not to mention, to be an entrepreneur is a sacrifice for some seasons in our lives that could never be taught at any school. It is not meant for the faint-hearted. I need to give up totally a regular job denied applications after applications to be able to grow our life's own choice when you're married to an entrepreneur himself. See, there are many legit validations even if we as a couple do not have children for years, it does not mean you are loaded with wealth. We have to start from scratch, literally from nothing if you choose to be an entrepreneur. There are many challenges you need to go through, and that is a book in itself. I am not alone feeling similar pressure how insensitive brethren requires financial support, not in its ripen time. I heard some of my friends that do get similar messages on Facebook, and they are truly disheartened with people's expectations towards individuals path of life. Mind you, some of these do not have children as well. This incident reminded me when I lived in Thailand during my very critical one-year transition. I have my father on the phone (working from another foreign country) at all times if I have enough monthly salary to send back home despite my first-year transition. I was renting on my own when I was teaching in a Thai school and the only foreigner female teacher so I could not ask someone to rent with me in half. I got debts to pay first and on top of that, another Brethren in Christ obligated me on the spot to support their church financially? If this is what a Christian life is then, it must be the Devil using them as well to put pressure on your life whether you would react Christ-like or devil-like! Bottom line, it's my life, and I am not selfish if I cannot help yet.